How many times have I wished for a T-shirt that says “bread baking is my cardio.” I’m not much of an intentional work-out type. I like walking and hiking all over Israel, but except for when I was determined to “lose the baby weight” and my much earlier cheerleading career in high school, I just don’t love hitting the gym. However, I do love baking bread and find that, oddly enough, kneading dough isn’t all that different from running. 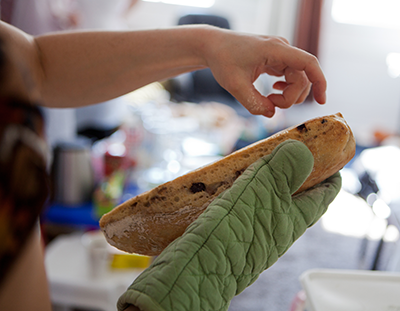 During kneading, your mind wanders into a meditative state while your body is busy at work. Granted it’s not as physically challenging as a run, but it does get the heart pumping, and you do eventually get fresh bread out of the deal, so there’s that. Bread baking is a lifelong learning process. Most recipes include a short list of ingredients—flour, sugar, salt, yeast and water. Others, like ones for challah, call for the addition of oil, eggs and an extra kick of sugar, but seldom much more than that. So really, how difficult could baking bread be with such simple ingredients, right? Well, the most important ingredient, especially true with doughs like challah that have been enriched with egg and oil, is time itself. Notice I didn’t say patience, but time. Let me explain. Yeast doughs, and bread baking in general, is a time-consuming task. Doughs tend to rise when they rise, and even braided breads often take much longer than you might think before heading to the oven. The trick is to make the dough—and then forget about it. Forget the recipes that indicate allotting 3 hours for your challah dough to rise. It’s gonna take as long as it takes, and you are a modern busy person who most likely doesn’t have that kind of time to just sit around and wait. Implementing the “make and wait” method might look something like this: Making the dough, setting it on the countertop in a covered bowl, then going to work. (If it’s the summer, stick the whole bowl of rising dough in the fridge for a cold, slow rise, which also coaxes a more complex flavor out of the dough). Or, prep the dough and leave covered on the countertop, then go to sleep, leaving it to rise overnight. A dough like challah will be fine left alone to work its magic. A crucial step in getting a bakery-like result involves letting the dough rise past the top of your bowl. I’m talking about a situation where the dough pushes the plastic wrap covering your bowl into a domed position, with carbon dioxide bubbles trying their hardest to escape. This is what challah dough should look like when it has completed its first rise. And don’t worry too much about rushing back to your abandoned dough either. Dough can remain fully risen for a few hours with no harm to the yeast. Even better, take fully risen dough, wrap it tightly in a plastic grocery bag or place in a covered container, and keep it in the fridge for up to three days before forming your challahs. Doing this earlier in the week will make challah baking a much more leisurely experience, and goes with my philosophy of making bread work for your schedule, not the other way around. Plus, cold dough is easier to work with, an added bonus for the lazy challah baker. When forming your initial dough, add your dry yeast directly to the flour: Unless your dry yeast is questionably old, there is no need to proof it in water, and you can throw it in with the rest of the dry ingredients. Add your water slowly: Start by using only 80 percent of the water listed in any dough recipe, and add more as needed until the dough is formed. This is the key to preventing a sticky mess. Then, more water can be added in very small amounts during the kneading process by dipping your fingertips in water, continuing to knead the dough until it is soft but not sticky. Flour the heel of your hand, not the dough: Adding too much flour to a dough will change the basic ratio and will leave you with a much heavier loaf that will differ in taste and texture from what the recipe intended. To avoid this, remove excess dough from your hands as you knead. When you do need to add flour, do so by flouring your hands instead of the dough. Use a plastic or metal dough scraper to manage any dough that sticks to the table: The scraper allows you to use less flour through the kneading process. Remember—the dough doesn’t control you, you control the dough. 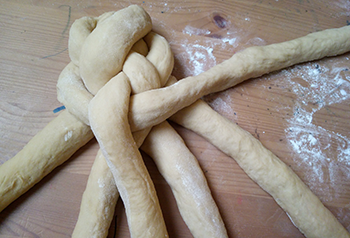 Use minimal flour when rolling out the challah strands: If you use too much, you won’t have enough resistance to create a longer strand with ease. In case you did add too much, just add a small smear of water to your work surface. 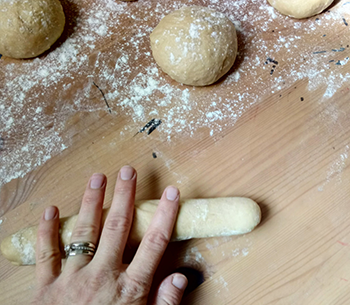 Push out as much air as possible when creating your strands: This may sound counterintuitive, but squishing out any air bubbles at this stage allows the yeast to bounce back completely and do its job when the braided challah is rising. Once your strands are attached to one another and ready to braid, a sprinkling of flour will prevent them from pulling and sticking to one another during the braiding process. Allow the challah to rise a full 1 1/2 -2 hours, or until puffed up like a marshmallow, and puckered on the surface. Double brush the challah with egg wash, once when it has just been braided, and then again with as light a touch as possible (to prevent collapsing) just before it goes in the oven. Bake one week and freeze for the next: Breads freeze well, and it will be one less thing to worry about before your Friday night Shabbat meal. Plus, think challah French toast whenever you get the urge, just saying. Seriously short on time, and need your challah dough or loaves to rise as fast as possible? Leaving dough or braided challahs to rise in a closed oven that has only it’s light on will provide a warm environment that will encourage the yeast to rise in a more efficient and timely manner. The braid grew apart in the oven: Probably the most common complaint in challah making, and one for which I’ve heard endless theories. 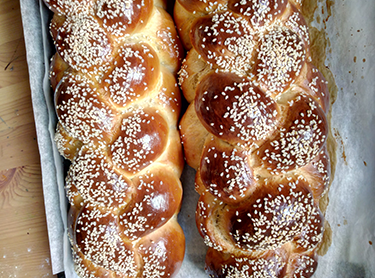 But the reason is simple: The braided challah was not allowed to rise to its absolute maximum. How do you know when your challah is ready to bake? The challah will appear puffed up like a marshmallow, with a puckered appearance to the surface. It should be about triple in size from when you braided it, and should have a slight wobble to it when you lift the tray to put it in the oven to bake, like it is waving you goodbye. The bread is dense like a cake: Again, a culprit of dough that hasn’t risen enough. Enriched doughs like challah can take an extraordinarily long time to rise, especially in cold weather, due to the large amount of sugar, eggs, and oil, which cause the yeast to work much harder than in simpler doughs that do not contain these ingredients. 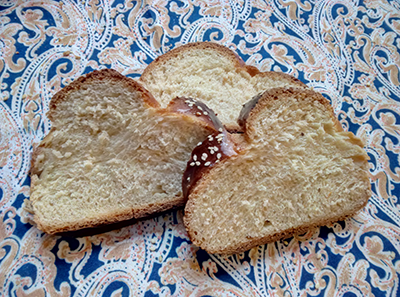 Challah is burnt on the outside and raw and doughy on the inside: In this case, the challah has been baked in an oven that Is too hot, allowing the outside to darken before the inside is fully cooked. To resolve this, take baking times and temperatures into account with what you already know about your personal home oven. (Does it run colder or hotter than it should, and is it properly calibrated?) Adjusting time and temperature based on this knowledge can make a huge difference in baking. Remember, despite what the recipe says, anything you bake is done when it is done. Use the time listed in a recipe as a guide, but look for what you would expect in your finished product, i.e. a cake that springs back to the touch, or a pie crust that is golden brown and flaky. Challah is already looking dark brown on the outside, but is only part way through the baking process: In this case, cover the top of the challah with a piece of aluminum foil to prevent the challah from further browning, while allowing the inside to finish cooking. If this occurs early on in the baking process, your oven’s temperature may need to be lowered. How to check your challah for doneness? Flick the bottom of your loaves as they come out of the oven in several places. A loaf that is done will feel light in weight and sound hollow across the entire bottom when tapped in this manner. Swap out sugar for honey and add 3/4 cup raisins for a Rosh Hashanah challah, or top with toasted almond slices and then a light dusting of powdered sugar once cool for a special Shabbat morning treat. 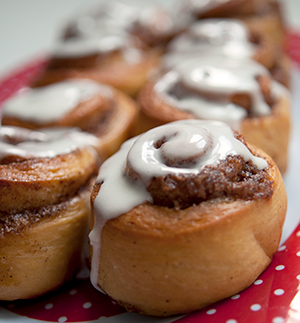 To make cinnamon or chocolate buns, roll out half a dough recipe into 1/4-inch thick rectangle, spread with 1/2-3/4 cup softened butter and sprinkle with a light coating of cinnamon and brown sugar; or spread with a thin layer of warmed Nutella (3/4 cup, or more as needed, and top with 1/2 cup chopped walnuts or pecans if desired). Roll rectangle up into a jelly roll, slicing into 2-inch wide pieces and setting aside to rise until puffy in a greased baking dish or lined baking tray (leave room between the rolls to grow), about 30-40 minutes. When ready, brush with egg wash and bake at 350 for 20-22 minutes, until golden and firm with a little give on top. Finally, brush with simple syrup while hot, let cool somewhat, then drizzle with a simple glaze (recipe below). 1. Cut day-old bread into cubes and toast in the oven for 12-15 minutes, until firm and golden. 2. Let cool, then pulse in a food processor until the bread has broken down into fine bread crumbs. Store in freezer for up to 6 months. 1. Cut leftover challah into cubes, excluding the crust, and drizzle with olive oil and a light sprinkling of salt, garlic powder and za’atar. Toss to coat. 2. Toast for 12-15 minutes until golden brown and crunchy. 3. Use in salads or on soup. Store in freezer. For a healthier wheat-oatmeal challah, replace one cup of bread flour with whole wheat flour and one cup of all-purpose flour with quick-cooking oats. This rich yet light and spongy challah has become my go-to after much searching and adjusting. It bakes up beautifully, freezes and keeps well. It also doesn’t fall apart when sliced for sandwiches. 1. Measure out flours into a large bowl. Into the flour, mix the sugar, salt and yeast, one at a time, stopping after each addition to mix it into the flour with your dominant hand, while the other hand holds the bowl steady. 2. Add oil, and briefly mix to work into the flour mixture. Add eggs, and mix in the same fashion. 3. Add 80 percent of the suggested total water amount and keep mixing with your one hand to form the initial dough. 1. Turn the dough out onto a clean working surface. Prep a small pile of flour for dipping the heels of your hands if necessary, and have a dough scraper nearby. 2. Knead until dough is elastic and smooth and bounces back when pushed on, a process of about 5-10 minutes. 3. Form the dough into a large ball and place back in your bowl. Cover top of the bowl with plastic wrap and place in a warm spot to proof, until dough rises to the top of the bowl (this could take anywhere from 5 hours to overnight). 1. Divide dough into half, then split each half into 6 sections (12 in total for two challahs). 3. Using both of your hands, roll each strand away from you and then towards you again, repeating as your hands move from the center to the outer edges with each movement. Once hands reach the outer edges, place them back at the center and repeat the process, until your strand reaches its desired length (about 12-13 inches in length). Use firm pressure while doing so to push out any air bubbles. 4. Repeat this process until you have 6 stands of the same length. Attach strands at one end using firm pressure, then fan out the individual strands. 5. To braid, bring the first strand from the left up and over to the right so it lays horizontally across all the remaining stands, and then repeat the same thing on the other side, taking the first strand from the right over all the way to the left, so the two strands overlap at the very top. Leave the strands overlapping, but fold the remaining part of the 1st strand from the right back down into the middle. 6. Bring the second strand from the left up and over across all the way to the right side, and then bring the first strand from the left back down to the middle. Repeat this process starting from the opposite side, bringing the second strand from the right up over across the left side, and then the first strand from the right down to the middle. 7. Repeat until you reach the bottom of the strands, while keeping the same proportion of braid size as much as possible. 8. Remove any excess dough at the very end, pinch ends shut, and neatly fold under the loaf. 9. Gently pick up braided loaf holding it from underneath on each side using both hands and transfer to a baking tray. 10. Brush with egg wash and let rise 1 1/2-2 hours (or until tripled in size and puffed in appearance). 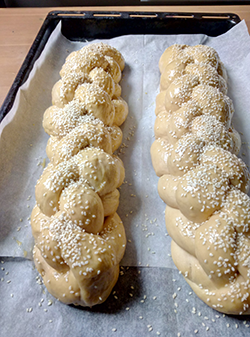 Brush again with egg wash, sprinkle liberally with sesame seeds and bake in a 350 oven for 35-40 minutes, or until challah reaches a deep golden color. Challah should sound hollow in the middle when flicked along the underside. 1. Repeat steps 1-4 above, forming 3 strands instead of 6. 2. Attach strands together at one end using firm pressure, then fan out the individual sections so they only touch at one end. 3. Bring the right most strand over the middle, then the left most strand over the middle, alternating like this until a regular braid is formed. 4. Repeat steps 10-12 above. One recipe of this syrup makes enough to baste pastries and cakes made from an entire recipe of challah dough. The rule is one standard ladle full for one cake, or about a tablespoon and a half of basting liquid for one medium sized cinnamon roll. Smaller pastries might only require a couple of quick brushes to keep moist. 2. Apply syrup to cakes: Using a ladle and a pastry brush, apply the hot syrup to the sweet buns, just as they come out of the oven. Makes enough for sweet buns made from one challah recipe. Variations: add orange zest, cocoa powder, cinnamon or almond extract to taste to transform this glaze into any flavor you choose. In a medium bowl, mix ingredients together until they form a thick but pourable paste. Give this mixture a minute to come together before adding additional milk, as it tends to take a minute to blend. Drizzle or spoon glaze over cooled sweet rolls, and enjoy. Love you, and love this piece. Some very good tips on proofing and shaping. The recipe is probably good, too. But serious bakers measure by weight, not volume. And serious bakers check doneness with an instant-read thermometer. Thanks for taking the time to read and comment. To clarify, the recipe and tips are adjusted for the convenience of the home baker, and I find it’s always good to know how to bake without gadgets. Happy baking,and have a nice week! Thank you Linda for the support! Wishing you the best, and a good week ahead. There’s another solution I found for the challah that hasn’t fully risen but will rise as it bakes: Glaze before baking, saving any unused glaze. Apply seeds if used. (I alternate sesame and poppy and sometimes mix them as we like them.) Bake as usual but check halfway through. The loaves should have completely risen by then. Using the remaining glaze (or make more,) brush it on the newly exposed areas of dough (and add seeds if desired) then return loaves to oven to finish baking. I take no credit for this technique as I found it in another recipe. However it works like a charm. Thanks for the tip! Baking is often about finding a solution to problems that arise as we make our way through a recipe. It’s sure handy to know how to fix things up when they don’t go as we planned, but I hope the tips and tricks here will help eliminate at least some of the most popular challah blunders out there. The most important thing is to be aware, as you are, of why things react a certain way in different situations. Both of those substitutes work great, and I have used them in the past from time to time. Just a matter of taste/preference. I never knew how to determine the challah had risen enough for baking. Your description is very helpful. The trick to not having dough turn into a mess, is to adjust the water in the recipe based on your location, and the season. To help take out the guess work, it’s always best to start by adding 80% of the water stated in the recipe, and only adding more if needed. In the case that you added too much water by mistake, using a plastic or metal scraper can help subdue the mess on your work surface. Once you’ve gotten the dough off the heel of your hand, try flouring your hand as your work, and not the dough, to prevent adding too much extra flour to the dough, thus throwing off it’s proportions. Why do my challah strands start to rip and unbraid during the rising ptocess? After rising for just one hour it seems like the strands cant handle its own growth and just rip. What starts out like a beautifully formed propotionate challah becomes a an unprportionate mess. 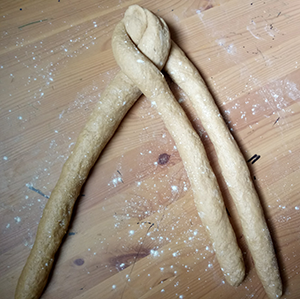 I think it would help you to dust the rolled out strands with flour before braiding so they won’t stick to one another, and for you to make your braid a but looser. Hope this helps! I totally agree about working with as few gadgets as possible. I’m pretty serious and do not use a thermometer to test the the temperature for doneness! One caveat about volume vs weight though, if you are tripling a recipe to say 15 cups of flour the potential for error increases because of the increased number of measurements. Either use a scale or, to use fewer gadgets, calculate the number of cups in a full 5# bag of flour from the label and REMOVE the amount necessary for the larger # of cups to remain- usually it’s fewer than 2 cups (less room for error). If you are tripling the eggs and do not have the exact sized eggs called for in the recipe google the amount of cups the number of eggs required- the error is small with 3 eggs vs 9 or 12. There is a huge difference between an extra large vs a small egg and 9x that difference can add up! BTW if you are weighing the flour check what the weight should be for AP vs bread flour or ww flour as they are different by weight. 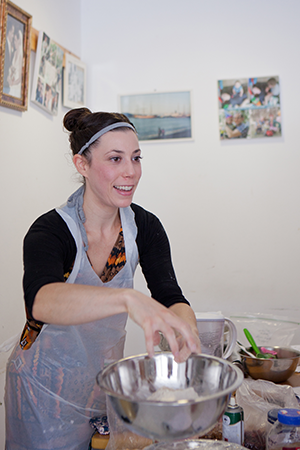 Shabbat Shalom and happy baking! This is so helpful, thank you! Do you have any advice for how to proceed when dough is done… in a bread machine? My machine’s cycle is 15-20 minutes mixing/kneading, 30 min sitting, 15-20 min kneading, 20 min sitting. So when it beeps, it’s already just done a second round of sitting. I’ve been told I should then take it out, let it sit for 10 minutes (but why? ), punch down, and then divide into strands, and then do a 45-minute rise once it’s all braided. This doesn’t seem to be working well, but I have no idea which part of it is the problem. I hope bread machine questions aren’t off limits! You’re so helpful on everything else, I hope you can advise on this too! Thanks. P.S. I only said it doesn’t seem to be working well… what happens is that it doesn’t rise much. The loaves spread a good bit, but only rise up a little. Also, my strands often blur together too much, which is maybe a separate issue. 1) I think you could give twice the time for your braided loaf to rise with a better result. Challah takes a much longer time to rise than a simpler white bread for instance. 2) To get the strands from sticking and blending together too much as you braid, try dusting the already rolled out strands with flour before braiding. If it still has not risen after 24 hours then I would assume you need to buy a new package of yeast. Otherwise, enriched doughs do tend to rise on their own schedule, which in the winter could mean many more hours than any given recipe specifies. Best of luck! I braided my Chalah n it has risen. I wish to bake it the next day. Shall I put it in fridge or leave on counter overnight? In this case sticking it in the fridge until morning, then pulling it out and hour or so before you’d like to bake the challah is the best way to go. Hi! Quick question… I usually let my challah rise for 1 1/2 hours or for 2 hours at the most. If I let it rise for 3 hours dot a little more will the change the taste or anything? Do you mean the second rise of your braided challah? If so, you’ll want to be careful of letting it rise too much, in which it could end up collapsing in on itself. If you are referring to the first rise of the initial dough, a longer rising time encourages more complex flavor development, which will surely have an effect on the taste of your loaf for the better. Is 3 hours ok for challah to rise? Will it change the taste or anything? Usually an enriched dough like this will take longer, but it depends on the season (In winter it can take much longer, so I like to let my dough rise overnight so as to not rush it). The result of a dough that hasn’t risen to the maximum will be much denser in texture, so it’s recommended to let it go as long as possible. I am living in California, and the weather here is very dry. And I am going to do a Challah workshop for a few friends in Florida, where the weather there is humid. I need to know which is the BEST flour to use in both States, can U give this tip? More so than which flour works best, you should adjust the amount of liquid you put in your recipe for a different climate or season. For this reason it’s always best to add 80% of the water called for at once, then add more only if the dough need the extra moisture. Would it work to use only all purpose flour if I don’t have bread flour? Yes all-purpose flour will work fine! It will have a lower gluten content, and so might be slightly denser in texture. Hello Jessica Halfin, Thank you for this page of tips and advice. I was trying to make a houska which is pretty much the same thing, but always getting poor results, your wonderful explanations showed me what I needed to do, and its turned out good every time since!